Military working dogs have long been a warrior’s best friend. Since World War I, dogs have been used in the military for various missions, including explosive detection, search and rescue, and security patrols. 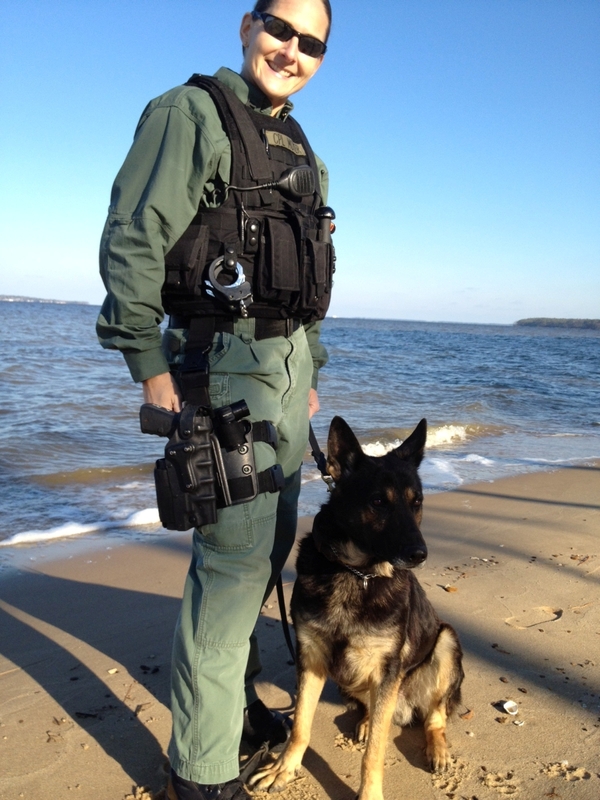 Brandee Moyer, a dog handler with Cherry Point’s Provost Marshal’s Office and her partner Rambo, a military working dog. Rambo was forced to retire in August after he injured his left shoulder during bite training, according to a Marine Corps press release. Most recently, hundreds of IED detector dogs – primarily Labrador retrievers – have been deployed to places like Iraq and Afghanistan to help Marine infantry units find explosives hidden by members of the Taliban. Memorial Bracelets, a website created in 2001 to help raise funds for Sept. 11 victims through personalized bracelets and dog tags, has added the abbreviation “MWDH” next to the branch of service members killed in action as a way to pay tribute to military working dog handlers. The website also lists military working dogs killed in action to remember the dogs that have been killed while deployed, according to a news release. “Not to take anything away from the sacrifice our soldiers who have been killed in action have made for this country, we thought it was also important to recognize the K-9s who have given their lives working to protect our fighting men and women from harm,” said Rob Tacy in a statement. According to the release, 17 handlers and six K-9s have been killed during Operations Iraqi Freedom and Enduring Freedom. 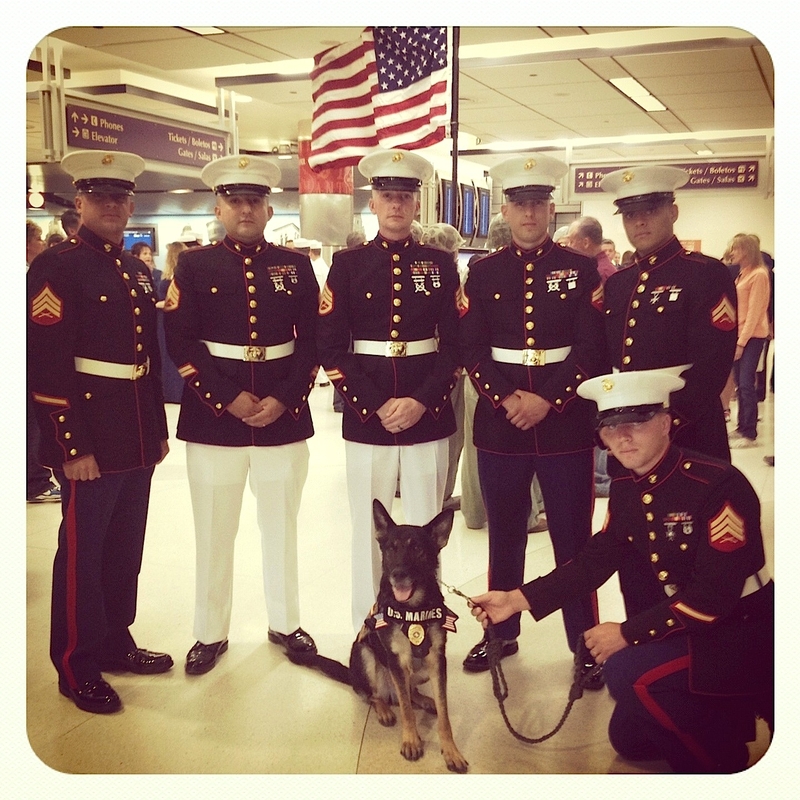 Rambo, a military working dog, poses with Marines. buddies,” said Lisa Phillips, founder of the Retired Military Working Dog Assistance Organization, in a statement. Prisoner-of-war bracelets, with the name, rank and loss date of an individual service member, were commonly worn in the 1970s to remember American POWs in Vietnam. “To keep the memory alive of those who have died at the hands of terrorists or fighting terrorism, we now also wear Memorial Bracelets,” states the website. Since its launch, Memorial Bracelets has donated more than $150,000 to charities supporting families of Vietnam POWs/MIAs, Iraq and Afghanistan casualties, and victims of Sept. 11. The website donates $2 to charity from every bracelet or dog tag purchase. When 17 handlers and only 6 dogs dies. this means that the dogs did not sacrifice their lives for handlers, but the other way around. It is good to know that we recognize the work the dogs and handlers do for us. I am pleased that these “forgotten” heroes are being recognized!!! Man’s Best Friend and, their handlers have contributed so much! I’ve been searching for the # of handlers and K9’s KIA in Iraq and Afghanistan and I got to this site and saw the comment dated 11/6/12 that 17 handlers died and only 6 dogs that it means that the dogs did not sacrifice their lives for handlers. Honestly the person making the comment hasn’t a clue. I do not profess to be a handler but I do have some insight into the job of the K9 and handler. There are too many variables to disparage the training, courage and unconditional love these dogs have for their handlers and I might add vice versa. I don’t have to go into details because anyone reading my comment that has any insight will know I’m correct. God Bless all our soldier, 2 and 4 legged. They are all our Heroes! Frank, Since the Start of Iraq almost approximately 34 Handlers and 34 dogs (give or take 1 or 2 of each) have been killed. Ishtar? Where you got 17 and 6 is a mystery to me. My numbers includes known handlers and dogs from our allies also but the U.S. is way out in front with numbers killed (as usual). I’m a Vietnam era Sentry Dog Handler and belong to a group called The Dawgs Project (AKA Feed The Dawgs). We bring steak BBQs to all Bases, Forts, Ports, etc. in CA,NV and AZ that have any Military Working Dog Teams just to let them know someone besides their loved ones are thinking about them. CHECK OUT OUR WEBSITE TO SEE EXACTLY WHAT WE DO. Odd “numbers” are VERY possible. Small arms fire, IED’s may take out one of the other but not both. A dog normally cannot take out a sniper from a distance. etc. etc. etc.